Be the first to share your favorite memory, photo or story of Bobby . This memorial page is dedicated for family, friends and future generations to celebrate the life of their loved one. 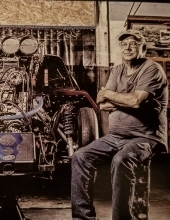 Bobby Joe Grubb, age 68, of Manchester, passed away Saturday March 16th, 2019 at his home. He was an Avid Racecar Enthusiast. Bobby is survived by the following children: Debbie Lynn Hibbard and her husband George, Rodney Joe Grubb, Bobby Joe Grubb Jr., and Sharon Kaye Napier, all of Manchester. He is also survived by two nephews who feel like sons Mark Woods and Glenn Woods, and two siblings Whitley Grubb and Eyvonne Woods both of Manchester, 4 grandchildren: Savannah Hoskins, Tyler Grubb, Scottie Napier, and Jeremy Napier, and these great grandchildren: Olivia Napier, Bella Napier, Hunter Napier, Easton Napier, and Braxton Grubb. Bobby is preceded in death by his wife Sudie Grubb, his parents Farris and Fronna Grubb and 5 siblings: Alvin Grubb, Jarvis Lee Grubb, Lester Grubb, Linda Grubb, and Ronnie Grubb. The funeral service will be held 2 PM Tuesday at the Britton Funeral Home Chapel with Paul Stewart officiating. Burial will follow in the Grubb Cemetery at Stacy Branch. Visitation will be after 6 PM Monday at the Britton Funeral Home Chapel. To send flowers or a remembrance gift to the family of Bobby Joe Grubb, please visit our Tribute Store. "Email Address" would like to share the life celebration of Bobby Joe Grubb. Click on the "link" to go to share a favorite memory or leave a condolence message for the family.